Why Camco OCR systems bring efficiency and benefits. As genuine engineering company (founded in 1999), Camco designs, develops and implements its own technologies. Unlike sales organizations or system integrators, we keep total control over our hardware and software, and support a long-term product strategy. Our in-house engineering furthermore facilitates custom-tailored automation solutions. This approach results in a flexible and agile project delivery cycle and sets us apart from our competitors. Successful process automation implies that many different (sub)systems function as one, achieving global process optimization. Camco’s hardware and software systems are designed for seamless integration with other systems, such as the TOS, vehicle booking and planning systems. On top of that, our expert staff is experienced in complex integrations. Our installed base covers most TOS, vehicle booking and planning systems, port community systems, PLCs, etc. When choosing Camco as a technology partner, you get a partner who really understands your business. We have learned that every terminal is unique and that your terminal automation project deserves a personalized approach. Our expert capabilities and technologies, developed through 15+ years of industry experience, enable us to bring complex projects to a successful end. 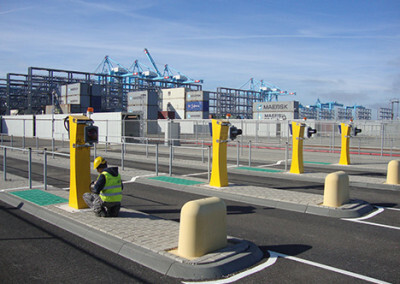 Already 150+ terminal operators worldwide have opted to work with Camco: check our references. We invest in long-term relationships with our customers and give assistance during each step of the project. Even before a sales agreement is in place, our business developers will assist you when analyzing your terminal automation needs. Together with you, our account managers, engineers and software team will help define the best strategy, design the most optimal solutions and accomplish your business goals. We offer the full package under one roof: design and analysis, implementation and training, aftercare via maintenance and support.